Reading and share top 2 famous quotes and sayings about Spring Equinox by famous authors and people. Browse top 2 famous quotes and sayings about Spring Equinox by most favorite authors. 1. 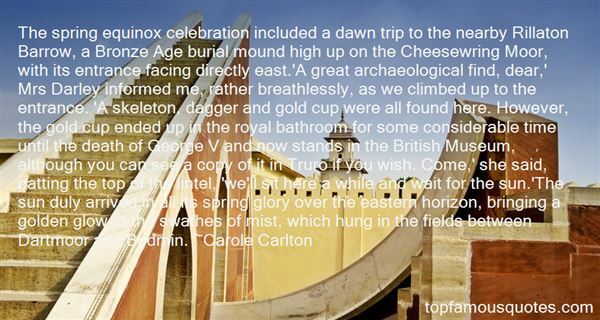 "The spring equinox celebration included a dawn trip to the nearby Rillaton Barrow, a Bronze Age burial mound high up on the Cheesewring Moor, with its entrance facing directly east.‘A great archaeological find, dear,' Mrs Darley informed me, rather breathlessly, as we climbed up to the entrance. ‘A skeleton, dagger and gold cup were all found here. However, the gold cup ended up in the royal bathroom for some considerable time until the death of George V and now stands in the British Museum, although you can see a copy of it in Truro if you wish. Come,' she said, patting the top of the lintel, ‘we'll sit here a while and wait for the sun. 'The sun duly arrived in all its spring glory over the eastern horizon, bringing a golden glow to the swathes of mist, which hung in the fields between Dartmoor and Bodmin." 2. 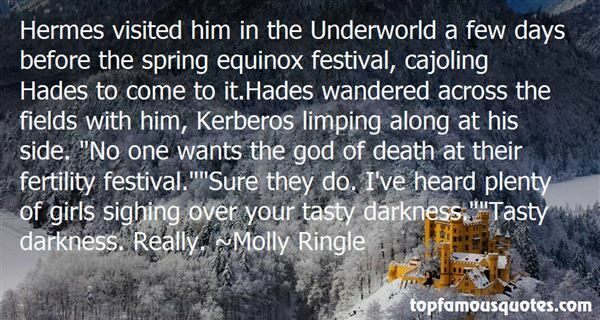 "Hermes visited him in the Underworld a few days before the spring equinox festival, cajoling Hades to come to it.Hades wandered across the fields with him, Kerberos limping along at his side. "No one wants the god of death at their fertility festival. ""Sure they do. I've heard plenty of girls sighing over your tasty darkness. ""Tasty darkness. Really."